"Chinar Daastaan-E-Ishq" is a 2015 hindi film which has Faisal Khan, Inayat Sharma, Dalip Tahil, Pramod Mautho and Shahbaz Khan in lead roles. 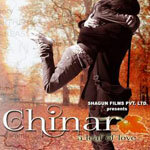 We have one song lyrics and one video song of Chinar Daastaan-E-Ishq. Salim Sen has composed its music. Ali Aslam and Aayushi Shah have sung these songs while Jamil Ahmed has penned its lyrics.